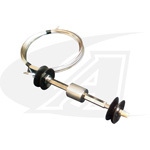 Home / Purge Gas Equipment / Purge Baffles From 1-5" to 16"
Arc-Zone.com® is the world's leading supplier of high-purity welding products and accessories. Durable tube and pipe purging systems are designed for quick, cost effective purging of a full range of pipe diameters and schedules. They're engineered to reduce purging time, decrease labor costs, and lower shield gas cost. Most importantly, purge baffles are proven to improve tube and pipe weld quality. Based on your application, choose between our heavy-duty, dedicated Purge Baffles designed for a single pipe diameter, or choose a versatile Modular Baffle System which includes a variety of interchangeable parts that can be customized to handle all of the pipe diameters and schedules that come your way.